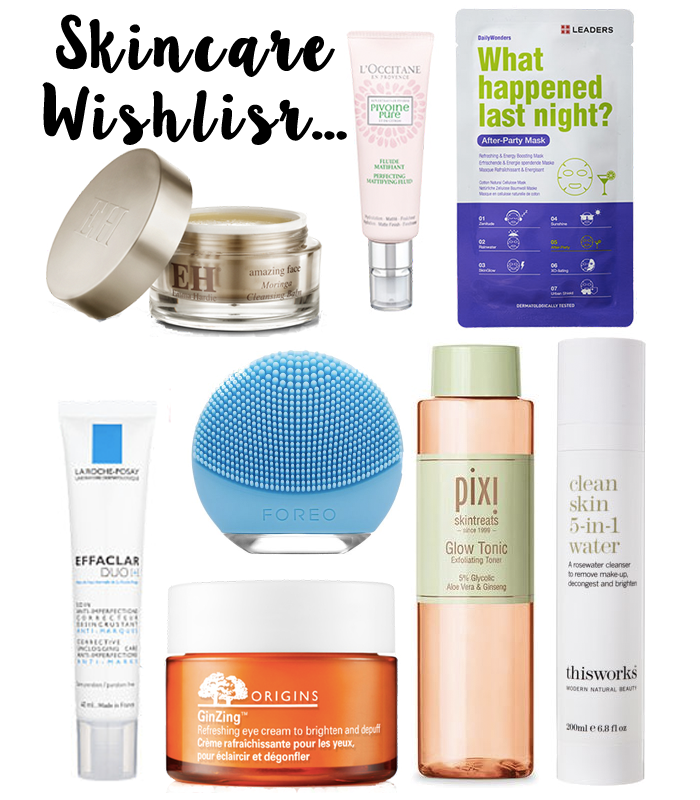 I haven’t done a skincare wishlist for aaaages! I’ve actually been really happy with my skin recently, minus the odd period spots it’s been keeping nice and clear which is something I haven’t experienced in years. I feel like winter is a time for focusing on skincare though, it’s cold outside and our skin takes a bit of a beating. First in my wishlist is a L’Occotaine moisturiser, I love the look of this Perfecting Mattifying Fluid, my skin is a bit on the oily side so a matte finish sounds brilliant. This Leaders face mask was my next pick, and honestly, it was just because of the name, What happened last night?. It made me giggle and I’m sure you can relate with waking up after a big night out and your skin feeling disgusting. A face mask to fix that would be perfect! This Works Water really intrigued me, the botanical and rose water mix sounded divine. Pixi Glow Tonic is something I’ve been lusting on for a while, I’m pretty sure nearly every single blogger has it but me – the packaging is enough to tempt me tbh! Despite the price tag, Luna Go seems amazing, and small enough to pop in your travel bag too! my eyes can get a bit dry, sore and dull in the winter so the Origins GinZing Eyecream is definitely on the list, I’ve heard so many good things! This year I’d love to try a cleansing balm, as opposed to a cream, water or gel, and the Emma Hardie Cleansing Balm sounds soooo dreamy. Finally, an oldie but a goldie. I once had the La Roche Posay Effaclar Duo years ago when it hit the blogosphere, but since then I’d forgotten about it. I think it’s time it returned to my skincare collection! "6 Reasons to love Valentines Day"